The American Patriot Gift Basket is a beautiful wood chip basket in red, white and blue. This basket is filled with delicious gourmet items that will please any recipient. Included in this basket is Molly and Drew’s beer bread and their dipping sauce, gourmet sun dried tomato cheese spread, Lord Nut Levington’s flavored peanuts, Mississippi Cheese Straw’s Sea Salt Caramel’s Cookie Straws, Chaou’s Firecracker Chocolate Bar, Popcornopolis’s popcorn, Sausage and Lindt Chocolate Truffles. 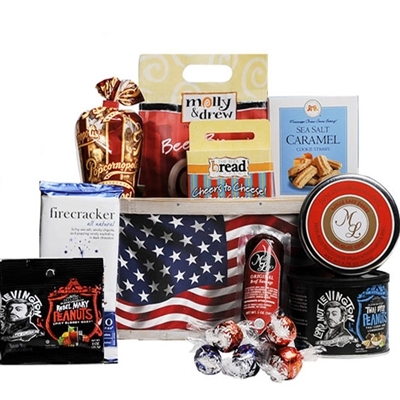 This basket not only shows the true colors of the U.S.A. its contents are either Red, White or Blue, celebrate America!